As the temperature rises and we spend more time frolicking outside (hello, summer! ), there is one annoying downside: body acne. Some of us are plagued with it more than others (the sweaty struggle is real), but I'd go so far as to say that we've all been there. To keep your back, chest, bum, and everywhere in between clean and clear, we commissioned Dr. Rachel Nazarian of Schweiger Dermatology Group for help. Here, she outlines everything from why the breakouts are happening to the best ways to prevent them and how to spot-treat when they inevitably arrive. "Both chest and back acne are really similar—and share a somewhat similar etiology," explains Nazarian. "Both areas contain a dense collection of sweat and oil glands, and since most of us wear a shirt throughout the day, areas underneath our clothing are subject to occlusion by fabrics." She continues, "The back is additionally irritated and occluded by rubbing by items like backpacks and the back of chairs. The production of sweat and oil on the skin throughout the day, and the inability of skin to aerate well under clothing makes it a prime location for acne to sprout. The major difference is that the skin is thicker on the back than on the chest, and can tolerate stronger acne medications. The downside is that the chest area is much easier to access and treat with topical medications while treatment of the back isn't quite as simple, because it's just out of reach; the process of applying acne medication to the back is a true challenge for most people." "People with a distribution of acne in areas of the upper back or posterior shoulders are ideal candidates for treating at home because these areas are much easier to reach, and medication can be more effectively placed. If you're noticing scarring of the skin with your breakouts, skip the OTC step and go straight to your dermatologist. This type of acne may require oral or prescription-strength topical medication, and waiting for over-the-counters to work (if they work at all!) will only allow more time for scars to form and accumulation of potentially irreversible damage to the skin," Nazarian advises. "It's really too difficult to spot-treat back acne—no one has the acrobatic skills to manage that!" Nazarian says. "The best route is a bodywash. Benzoyl peroxide is a great option for red deep bumps on the skin, the pimples that tend to be a bit more painful." 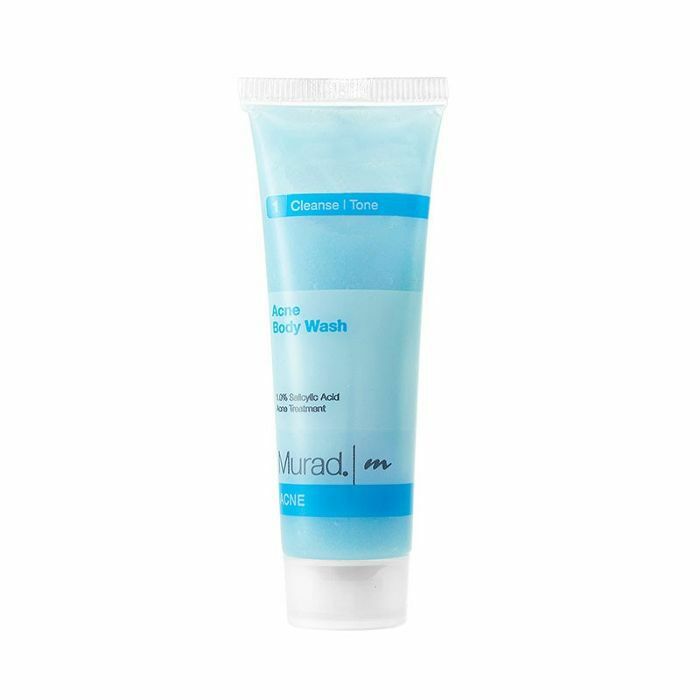 We really like Murad's Acne Body Wash ($40). Nazarian explains, "Although benzoyl peroxide can bleach sheets, clothing, and towels, it's a great medication that will better treat some of the deeper acne pimples. Glycolic acid is an exfoliating ingredient that helps remove dead skin cells and can allow the other medications to work more effective and penetrate skin easier. But in addition, it also helps dark spots and marks fade faster, which means your skin is going to look better faster." 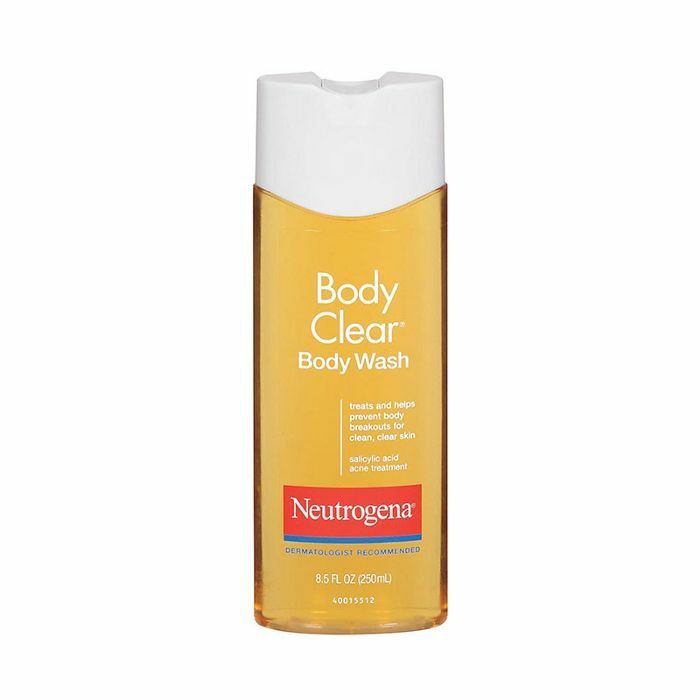 Our favorite drugstore option is Neutrogena's Body Clear Body Wash ($6). "Lather up the wash and allow it to sit on the skin for at least five minutes before rinsing. Look for tools at the drugstore to help you apply the body wash to the back more easily. 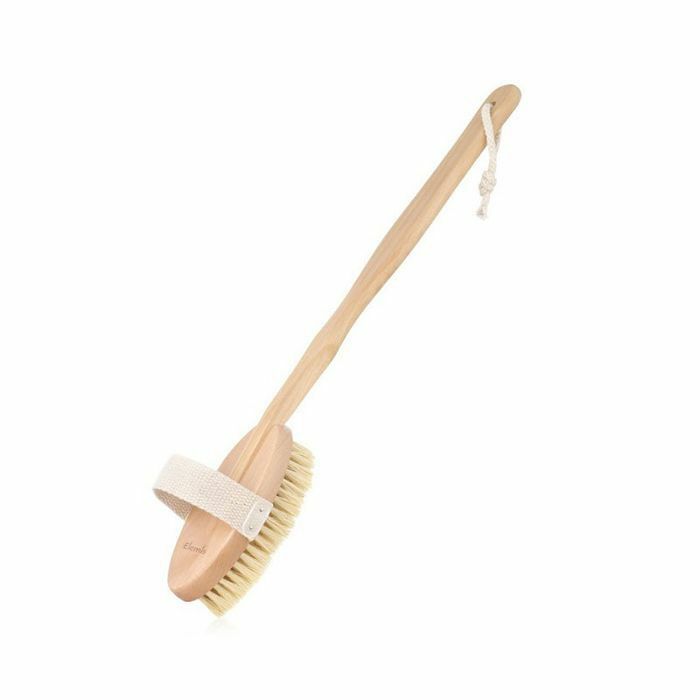 My favorite is the loofah back brush, which has a long wooden handle, making it much easier to reach the entire area." Try Elemis's Skin Brush ($48). "Some milder forms of face and chest acne can be improved with modification of lifestyle habits (changing out of gym clothes quickly and showering immediately after a workout so sweat and bacteria are cleansed from the skin, and wearing lightweight breathable fabrics). Small red bumps, and particularly blackheads and whiteheads, can usually be addressed with over-the-counter products," Nazarian suggests. "Bodywashes, although also quite useful, only have limited contact with the skin and will not be as effective as medication that's leave-on," she adds. When you're dealing with chest acne, you have the ability to apply medication and leave it on—effectively. Because the chest is a little bit more delicate than the back, use a gentler combination of medication and try to avoid harsher techniques that can dry out skin (such as scrubs and beaded washes). 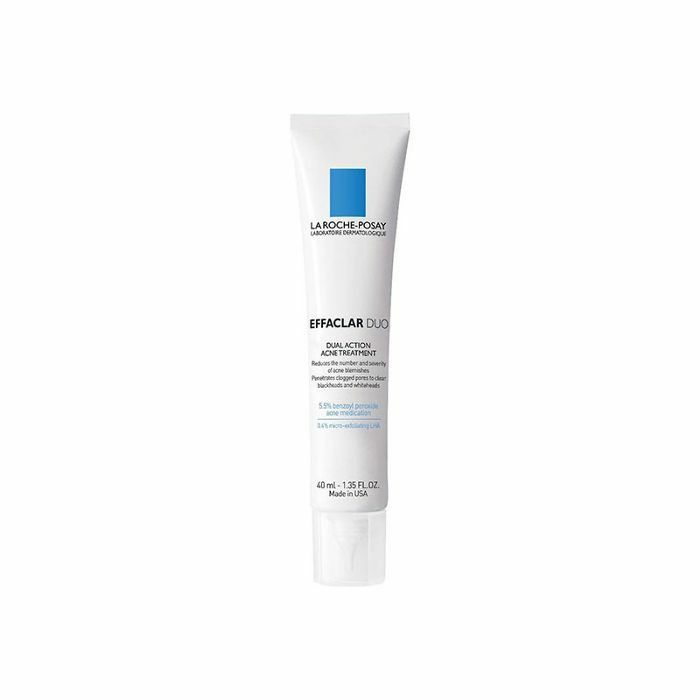 Instead, look for gentle acne medication with lower levels of benzoyl peroxide, such as La Roche-Posay Effaclar Duo Dual Acne Treatment ($37), which is less likely to irritate. Also, because the chest is so accessible, you CAN spot-treat when something pops up—just make sure you're using a product that's specifically made for spot-treating, which will be less likely to over-dry and over-inflame skin. 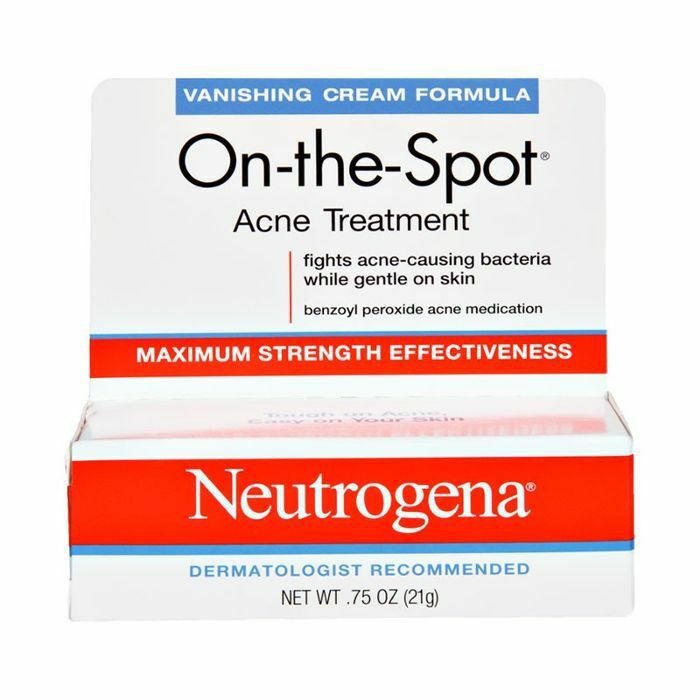 Neutrogena On the Spot Treatment ($5) and Philosophy's Clear Days Ahead Fast Acting Salicylic Acid Acne Spot Treatment ($19) are both good options, as they're nondrying and gentle. "Prevent this by avoiding tight pants and leggings and wearing clothing that allows for heat and sweat to dissipate through the fabric (cotton is great). Treatment is best done through gentle exfoliating products (avoiding harsh scrubs that can irritate hair follicles further). Amlactin ($14) is a great over-the-counter lotion that breaks down the dead skin cells that can clog up pores and hair follicles. Use it like a classic body lotion to the area daily. 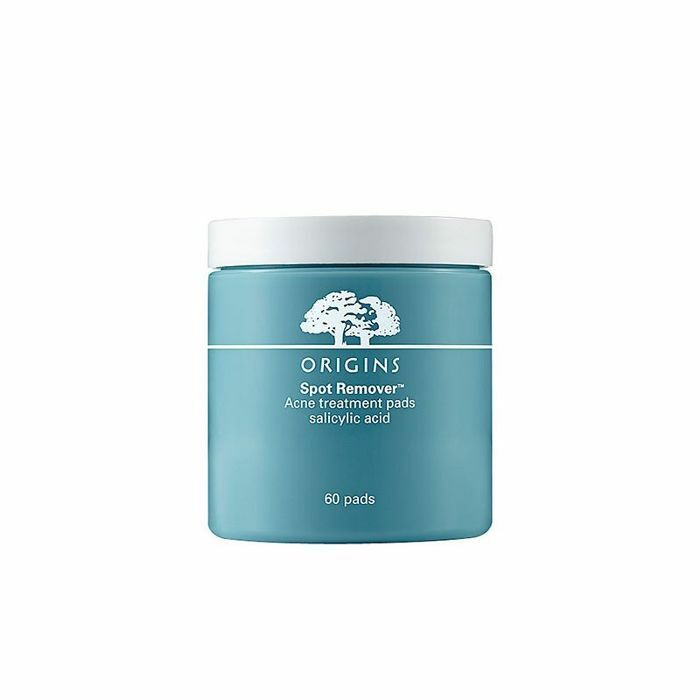 Origins Spot Remover Acne Treatment Pads ($29) are saturated with salicylic acid, a great acne-fighting ingredient, and is an easy method of applying the medication: Just wipe over the area nightly." "Of course, acne can happen anywhere—and depending on the location, there may be a specific cause—or sometimes even the same cause (hormonal acne can cause a variety of distributions of acne on the body). Remember to also start with a gentle acne regimen to prevent the over-dried, inflamed response that an aggressive treatment can trigger. As a basic rule to preventing acne, allow skin to breathe, and avoid tight or occlusive clothing whenever possible (this includes headbands, shirts, even hats). Make sure the products you're using are oil-free and state clearly that they are noncomedogenic—even lipstick (people can get pimples around their lips). "Finally, if your acne is leaving scars behind, or not responding to over-the-counter treatment, skip the trial and error and make an appointment with your dermatologist. Some acne is just too stubborn and will require prescription medication or pills!" Because we need to pay rent (and we're thinking you do too), read about the best ways to get rid of breakouts without spending a ton of money.